Takeaway: We forecast an OPEC production cut of 1.066Mb/d with return of high over-compliance in 2019 - plus 2018 supply losses from Iran & Venezuela. 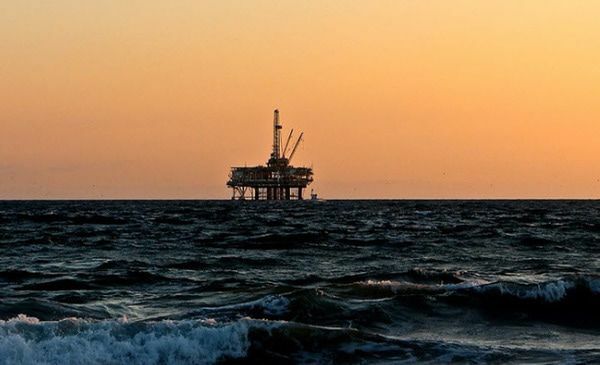 Oil prices retreated sharply this week after OPEC’s Joint Ministerial Monitoring Committee (JMMC) meeting last Sunday failed to give the market concrete specifics of planned production cuts to reverse downward momentum in prices. Saudi Arabia said it would cut production by 500,000 barrels per day (b/d) in December but JMMC co-chair Russia sent mixed messages about the path forward. 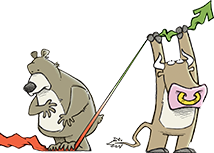 Certainly, there are other macroeconomic factors influencing prices, including the strong dollar as well as concerns about trade and emerging markets. But from an oil fundamentals view, markets are largely focused on oversupply. In our view, the high tide of oil supply is receding, and the hard numbers of actual production cuts that the market seeks could come even before the December 6 OPEC meeting in Vienna. OPEC has set the stage to extend the production cut agreement into 2019. We forecast an OPEC production cut of 1.066Mb/d with a return of high over-compliance levels in 2019 - plus 2018 supply losses from Iran sanctions (1.1Mb/d) and Venezuela (850Kb/d). As a result, we see oil prices recovering by year-end. Here are some key developments we see ahead for the oil supply equation. The big picture for investors has not changed: OPEC is setting the stage to extend the production cut deal into 2019. The pact with Russia and other non-OPEC producers is currently scheduled to expire at the end of the year. While Russia sent mixed signals at the JMMC meeting, we believe it will be on board with the Saudi-led initiative. We see OPEC+ reverting back to “over-compliance” or deeper cuts from current levels. The JMMC said October compliance was 104% but we believe “over-compliance” may increase as high as the 152% level reached in April 2018 and lead to a production cut of about 1.066 million b/d. Saudi oil minister Khalid al-Falih said Sunday that the kingdom would cut December production by 500,000 b/d but we believe it is already cutting production in November. 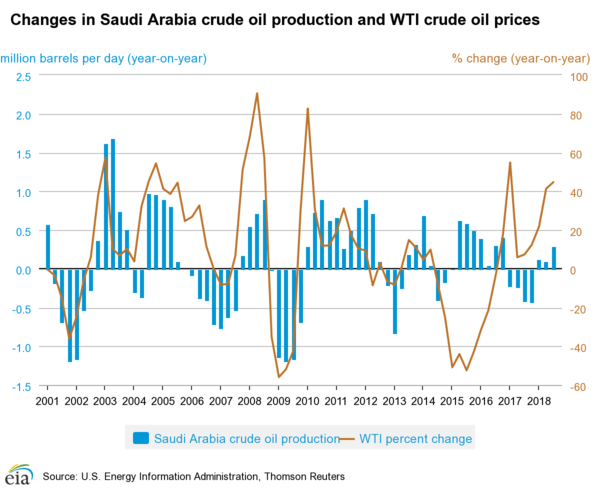 As we have written in recent notes over the past few weeks, we believe the Saudis are taking their foot off the “Pump for Trump” gas pedal with the US mid-term election behind us. We see Saudi Arabia production declining early next year to Q1 2018 levels of about 10 million b/d that translates into a cut of about 600,000 b/d from October. Despite all the talk about waivers and zero exports, Iran exports will be cut by more than half this year. No one thought Iran was going to zero exports. When we forecasted last year that Iran sanctions would cut 1M b/d from Iran’s exports, it was dismissed as too high. The next highest forecasts were from EIA and IEA that estimated a loss about 500,000 b/d from sanctions. But the reality is US sanctions will remove 1.1 million b/d of Iranian oil from the market in November (from a May baseline). Three of the eight “waivers” will terminate in January thereby increasing cuts in Iran exports to 1.3 million b/d and likely rising from there (based on our Hedgeye forecast for Iran exports). OPEC’s Presidency will transfer in 2019 to a new country/member based on alphabetical order. This means that Venezuela will become OPEC’s President in 2019 after the UAE’s term ends at the end of this year. Venezuela has involuntarily led OPEC's production cuts this year with production sharply down by 740,000 b/d based on OPEC’s secondary sources of production for October. Venezuela loses about 50,000 b/d per month so we estimate its production will be cut by 840,000 b/d in 2018. We agree that there will likely be stock builds in the first half of 2019 but we think it will be much lower than expected with our forecasted OPEC cut of 1 million b/d. 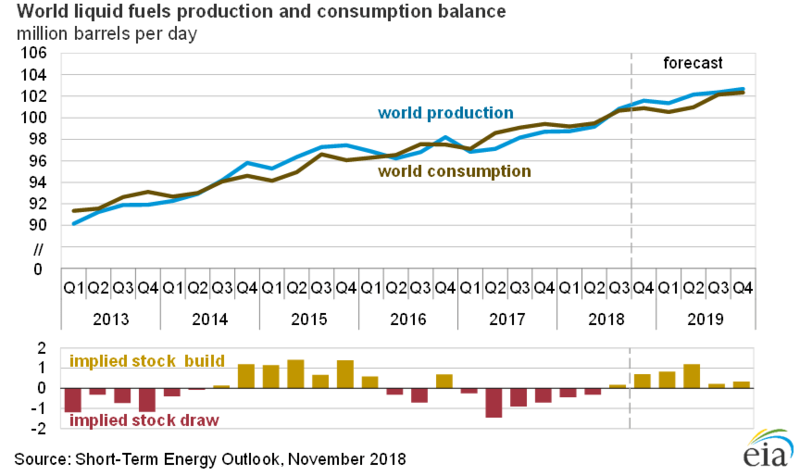 Moreover, EIA and IEA both forecast oil demand growth in 2019 of 1.4 million b/d. 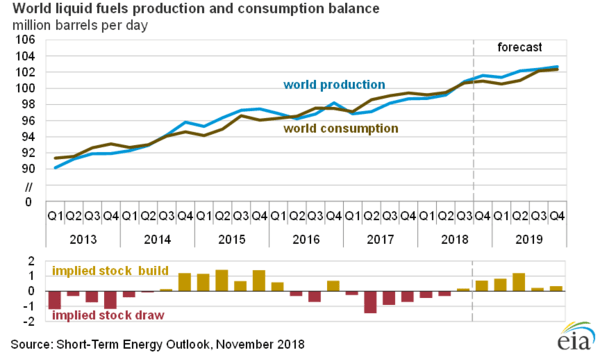 While non-OPEC production is widely expected to increase (led by the US) in 2019, EIA's latest Short Term Energy Outlook forecasts supply and demand to be in balance next year.